The Shannon Free Zone has become home today of the country’s first drive-thru Starbucks as the US coffee house chain opened the doors of its latest outlet to the public. 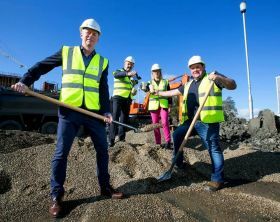 The 204sq metre unit developed by Shannon Group subsidiary, Shannon Commercial Properties, will employ 15 people as it becomes the latest page to turn in the evolving story of the Shannon Free Zone. The US based giant, which is among the world’s largest coffee companies and coffee house chains, operates over 20,000 outlets globally but this is the very first drive-thru in the Republic of Ireland. Starbucks opened its first Irish store in 2005. Located in Shannon Free Zone ‘West’, the single storey unit will include outdoor - as well as indoor - seating, ideal for the heatwave currently gripping the nation. Given its location in one of the country’s largest industrial parks, the unit also, appropriately, comprise a coffee dock/meeting hub that will service the entire industrial estate and prove an additional draw for FDI companies, who typically look for such facilities in new investment locations.